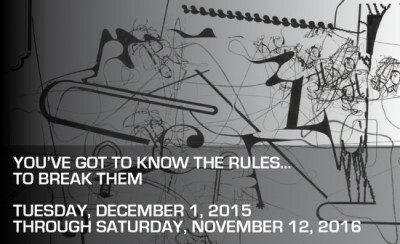 It is almost December and that means Art Basel Miami Beach is fast approaching! Last year the massive fair attracted more than 70,000 to Florida’s neon capital. With over 200 galleries exhibiting for the 14th edition of the fair, the turn-out is expected to be even bigger and better than ever and you don’t want to miss a thing. Here we compiled a list of the most promising events of the week. Check out our day-by-day guide below. Once you’ve got your events planned, click here to see our Art Fair Guide. Also be sure to check back for daily updates! “You’ve Got to Know the Rules…To Break Them” promises irreverent highlights from the couple’s encyclopedic holdings of today’s most influential work. The exhibition contextualizes New American Abstraction with German Neo-Expressionism, revealing earnest explorations of the artists technical acumen. Through experimentation, they antagonize accepted practices by drawing upon a variety of themes including cultural, historical and sociopolitical modes. 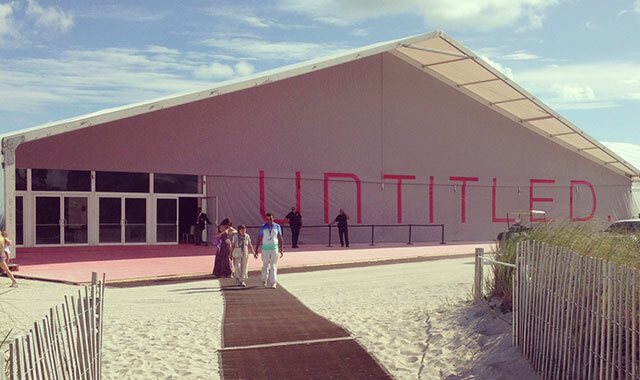 Design Miami is THE global forum for design. The fair brings together collectors, gallerists, designers, curators, and critics from around the world in celebration of design culture and commerce. It is both a marketplace, and a cultural forum, where museum-quality exhibitions of twentieth and twenty-first century furniture, lighting and objets d’art are on display alongside design panels and lectures from the world’s top designers, architects and artists. SCOPE invites its VIPs to an exclusive brunch to celebrate its 15th anniversary edition. With many well-established galleries upgrading to larger booths, SCOPE Miami Beach will debut a more spacious pavilion to showcase a robust VIP program featuring three curated sections: Juxtapoz Presents, the Breeder Program, and FEATURE. 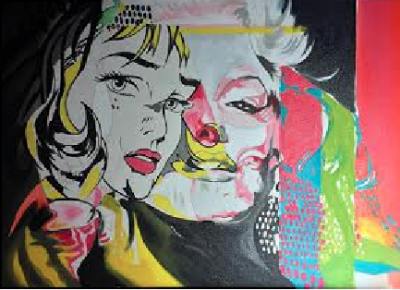 PULSE Contemporary Art Fair is an established part of the annual art calendar with editions in New York and Miami Beach. The fair is recognized for providing its international community of emerging and established galleries with a dynamic platform for connecting with a global audience. PULSE offers visitors an engaging environment in which to discover and collect the most compelling contemporary art being produced today. Kate Durbin will perform the fourth iteration of her ongoing performance work, Hello Selfie! during the Opening Celebration of PULSE Miami Beach 2015. In Hello Selfie! Durbin presents a new form of passive aggressive performance art, with female performers taking selfies in a public space for an hour straight, uploading them to the Facebook event wall in real time. A playful exploration of selfie culture and an intervention into the space of the art fair, where women have traditionally been muses for male artists, Hello Selfie Miami invites viewers to consider their roles as spectators and as fair goers. SCOPE Art Show is celebrated as the premier showcase for international emerging contemporary art and multi-disciplinary creative programming. Renowned for its uncanny ability to forecast new visual trends that are embraced globally, SCOPE Art Shows garner extensive critical acclaim and over 500 million annual impressions across print, digital and television. 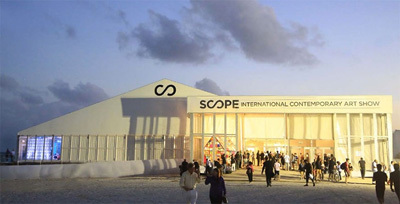 With cumulative sales well over one billion dollars and attendance of 1.2 million visitors, SCOPE is the largest and most global emerging art fair in the world. Untitled is an internationally curated art fair that focuses on curatorial balance and integrity across all disciplines of contemporary art. Founded in 2012, Untitled selects a curatorial team to identify, and curate a selection of galleries, artist-run exhibition spaces, and non-profit institutions and organizations, in discussion with an architecturally designed venue. UNTITLED’s fourth edition will introduce UNTITLED Radio on Wynwood Radio which will take the place of the customary program of conversations and talks by providing a unique roster of interviews, performances and playlists by artists, curators, and art world professionals, to be broadcast live at the fair. Art on Paper’s inaugural Miami Beach edition will launch during this year’s Miami Art Week, bringing the acclaimed fair to the epicenter of the international arts community. 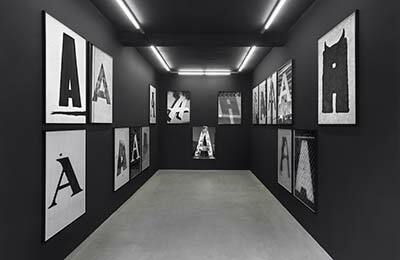 Art on Paper NYC welcomed over 20,000 visitors in March of 2015 and saw strong sales to top collectors, quickly becoming a New York City favorite.Art on Paper Miami’s exhibiting galleries will feature sculpture, drawing, painting, and photography, all unified by the medium of paper. 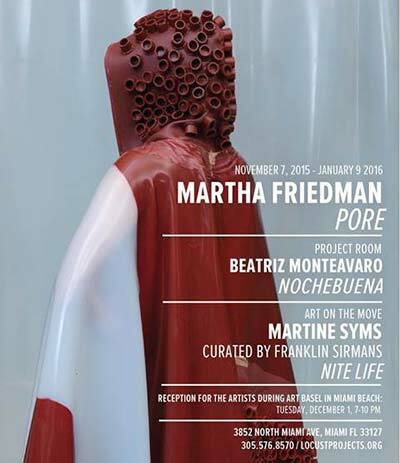 Miami Project runs concurrently with Art On Paper. 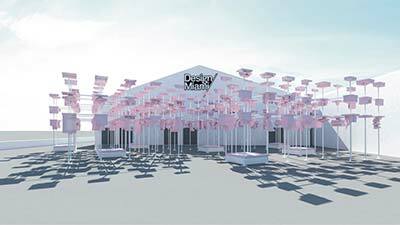 The fair returns for its fourth edition, bringing the best in modern and contemporary art to the fair’s new waterfront location The Deauville Beach Resort, creating another singularly elegant environment produced with the unique attention to detail that Miami Project has become known for. Building on past years of success, including 2014’s record attendance of over 25,000 visitors, Miami Project Edition 4 will feature 60 top galleries from around the world, affording easy access to and from the Miami Beach Convention Center. The art world is buzzing about the surprise pairing of competitive gallerists Jeffrey Deitch and Larry Gagosian. 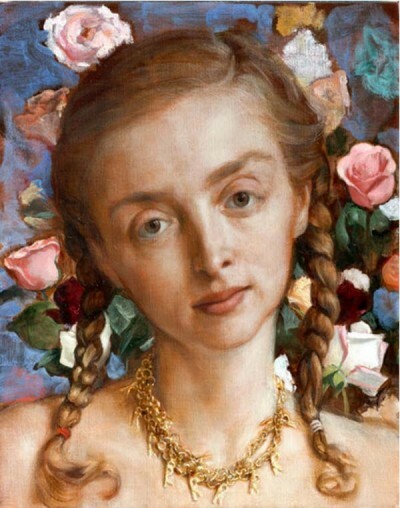 They are partnering in a joint exhibit of figurative painting from the ’80s and ’90s, entitled Unrealism. Work from undiscovered artists like Tala Madani and Jamian Juliano-Villani will be shown alongside more established figures like John Currin and David Salle. This is not one to be missed! X Contemporary premiers in 2015 at a 28,000 square foot art fair that will feature a selection of major exhibitions and over 27 exhibitors from the US, Europe and South America. The art fair will emphasize a cross-generational conversation in specially curated projects that add depth to the fair’s exhibitions, while considering the historic importance of the trends and cultural influences impacting artists today. The symbol X represents a destination point and an area of intersection, an evocative title for a new breed of art fair that will emphasize a crossover between the visual arts, fashion and brand collaborations brought together under the direction of Matthew Eck, the former co-director of SELECT art fairs. For the VIP reception, À-la-Mexique collaborators GRB Gabriel Rivera-Barraza and SPƎNGLISH’s Simon Guindi Cohen unveil a new edition of gold “Muy Muy” hats, available in limited quantity. The event will also include music by The Misshapes. 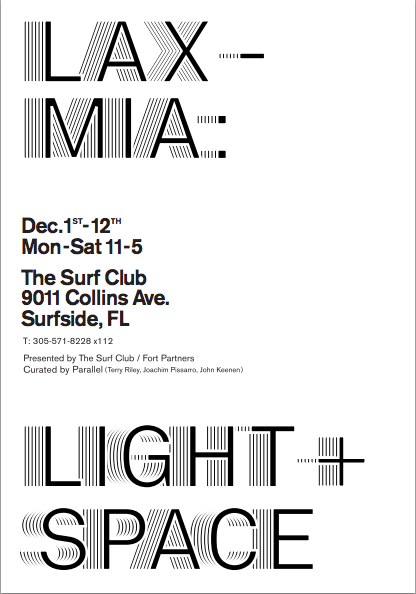 Exhibition “LAX – MIA: Light + Space” was curated by Terry Riley, Joachim Pissaro and John Keenan of PARALLEL and is hosted by The Surf Club and Fort Partners. As one of the most important annual contemporary art events in the United States, Art Miami attracts more than 82,000 collectors, curators, museum professionals and art enthusiasts from around the globe annually. Entering its 26th edition, Art Miami remains committed to showcasing the most important artworks from the 20th and 21st centuries in collaboration with a selection of the world’s most respected galleries. The sister fair to Art Miami, CONTEXT is dedicated to the development and reinforcement of emerging and mid-career artists. Launched in 2012, CONTEXT Art Miami’s open atmosphere creates a meaningful dialogue between artists, galleries and collectors while providing the ultimate platform for the presentation of mid-career, emergent and cutting-edge talent by emerging and established galleries. Ninety-five international galleries, vetted by the CONTEXT Art Miami Selection Committee, exhibit highlights from their gallery programs, solo artist exhibitions and curated projects. Celebrated multi-disciplinary artist and former Guggenheim Fellow Kalup Linzy will debut Season 2 of his satirical art industry soap opera, As the Art World Might Turn during the PULSE Opening Celebration in the PERSPECTIVES Lounge followed by a live performance by Linzy. Mana Contemporary hosts a dinner on Tuesday at 7pm. 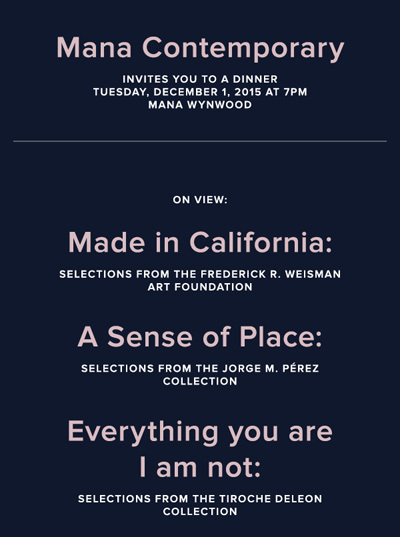 Made in California: Selections from the Frederick R. Weisman Art Foundation, A Sense of Place: Selections from the Jorge M. Pérez Collection, and Everything you are I am not: Latin American Art from the Tiroche DeLeon Collection will be on view during the event. There will also be a performance by The Miami Symphony Orchestra under Music Director and Conductor Eduardo Marturet. The event is cocktail attire and is invitation only. Brickell City Centre is hosting a bash for the books and transforming one block of its 9.1 acres (3 block) construction site, into an incredible deconstructed event space. Wooden Wisdom (Elijah Wood + Zach Cowie) will set the vibe. 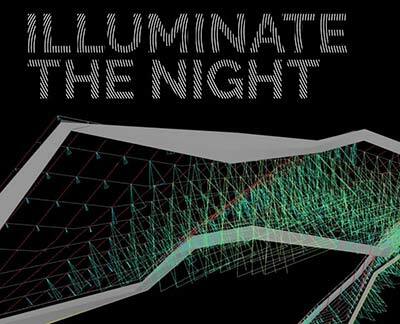 Witness the first-time illumination of the newly completed Brickell City Centre Climate Ribbon, imagined by famed designer, Hugh Dutton. Brickell City Centre is inviting the world’s most elite VIPs of the international art community and local influencers to experience a lighting ceremony and an art and design dialogue about the 150,000-square-foot glass, steel and fabric structure that artfully unites the projects three blocks. Bello Magazine hosts an exclusive event celebrating pop artist Henry Martinez at SuitSupply, hosted by BRAVOtv’s Philantropist and Gallerist Adriana De Moura. Expected VIPs include “Ash & Evil” star Rey Santiago, “Pretty Little Liars ” star Brandon Jones, “South Beach” actress Mia Matthews, model Daniel McNeer MLB player Trevor Reckling and more. The Institute of Contemporary Art, Miami (ICA Miami), is dedicated to promoting the work of contemporary artists, and to the exchange of art and ideas throughout the Miami region and internationally. ICA’s Opening Night! Miami Art Week, is in honor of the opening reception of Alex Bag’s exhibition, The Van (Redux), and Shannon Ebner’s on-going exhibition, A Public Character. 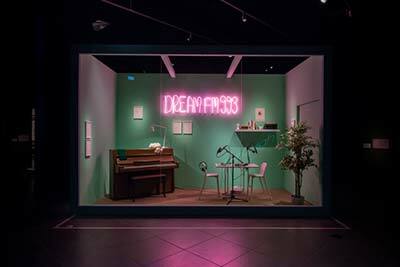 The DREAM South Beach hooked-up with Brooklyn-based artist — and new GQ “style guy” — Mark Anthony Green for an exhibition. The events will feature never-before-seen artwork and celebrations taking place in tandem with Art Basel, North America’s foremost modern and contemporary art fair. Pushing the boundaries of art and dance, the exhibition features four sculptures created from 1,000lbs of colored rubber representing the four humors. These massive “pours” are attached to costumes that will be activated during an experimental performance with dancer Silas Riener at 8 PM. 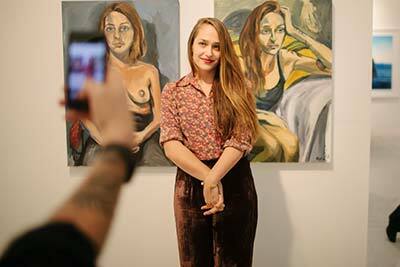 RIZM is a cutting-edge art fair that is multidisciplinary in scope. The fair’s mission is to promote the work of artists of color, who reflect global trends in contemporary art. 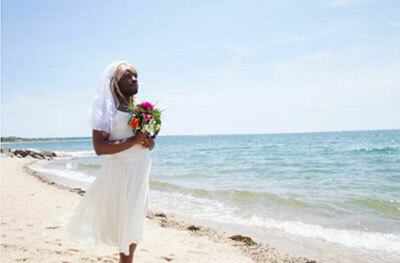 PRIZM will feature the work of emerging Miami-based artists of African descent, such as T. Eliot, and Asser Saint Val. These artists redefine their world and bring into focus socio-political and cultural issues pertinent to the people of African descent in Miami and beyond. The select artists are actively engaged in perpetuating Miami’s growth as a cultural hub. Join The Vinyl Factory, 303 Gallery, Hauser & Wirth, and Lisson Gallery for drinks and see The Rodney Graham Band perform songs from the new record, ‘Good Hand Bad Hand’. The event will celebrate the fourth year in a row that VH1 has teamed up with SCOPE to bring the ultimate mash-up of art, music and pop culture to Miami Beach. This year VH1 is taking you back to the early ‘90s with The Breaks – an interactive lounge space inspired by the upcoming VH1 original movie The Breaks.Check out original A Tribe Called Quest lyric sheets and rare authentic ’90s hip hop apparel on loan from DJ Ross One, author of Rap Tees: A Collection of Hip-Hop T-Shirts 1980-1999. Don t just take a selfie, make a GIF in the #PHHHOTO booth, and go home with a customized beat from Monster DNA! Soho House and BMW I celebrate Art Basel Miami Beach with an intimate conversation between BMW Art Journey artist Samson Young, and author Lawrence Weschler. Capacity is limited. Please RSVP. Cocktail Reception to follow. This members-only establishment is throwing a welcome party on Tuesday December 1st. Wynwood Walls presents “Walls of Change” VIP Party with special events including Calm Before the Sun – a Magnus Sodamin exhibit with Primary Projects and a Giant Polaroid exhibit created by artist Peter Tunney. 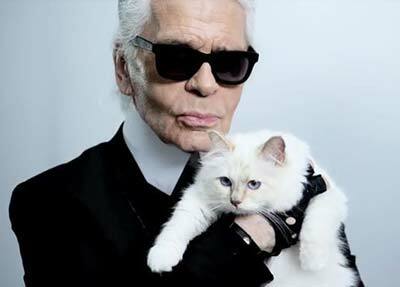 Galerie Gmurzynska hosts an invite-only cocktail party showing a retrospective of works by Karl Lagerfeld. 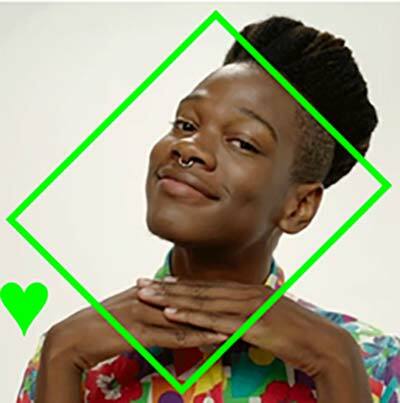 ICA Miami presents an exclusive performance by XL Recordings artist Shamir, celebrating exhibitions on view during ICA Miami’s Opening Night! Miami Art Week. DuJour Magazine party with Hilary Swank, Nan Bush, Bruce Weber, Adrien Brody, and more. Opening Party Tuesday December 1st, 10pm with Snarkitecture featuring artist Daniel Arsham with an exclusive installation for the evening. Out Of Order Magazine is hosting the event, music by Public School and other notable artists. This very selective party will continue each night from December 2nd through December 5th. Featuring Seth Troxler, Nicolas Matar and Orazio Rispo. Hosted by Paper Magazine, Silencio, A Hotel Life and One Management, the event will feature at Material Art Fair. 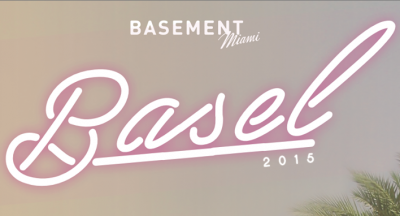 From 11 p.m. at Basement, 2901 Collins Ave, Miami Beach. 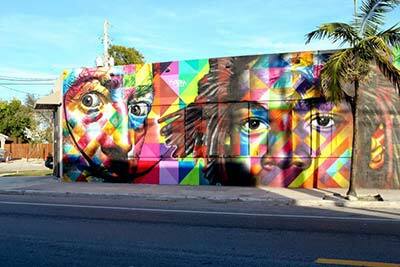 WALLmiami is proud to announce: – Favela Beach – Hosted by: Mr. Brainwash. Sounds by: Jus-Ske, Ruen + Reid Waters. Zen Freeman is a British DJ, producer, and remixer who has performed alongside Paul Oakenfold, Katy Perry, and Lady Gaga. 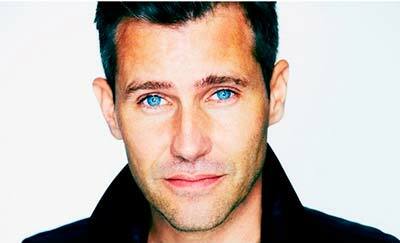 He is part of the Soho House family and will be making his way to the tent for a special Nu-Disco DJ set.